Panthur Review 2019: Is Panthur a Good Hosting? Australian-based Panthur provides simple, yet effective, web hosting solutions for everyone from individual website owners to big reseller agencies. You can expect all the services you need to host on the web in one product. 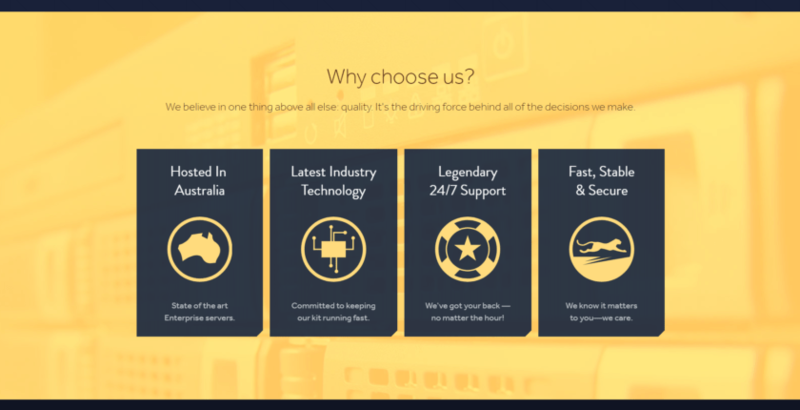 Interestingly, Australian-based Panthur started out as a free hosting service. In 2009, they became so popular that they decided to go commercial and start selling professional hosting solutions. They aim to offer a very modern hosting service that provides everything you need to host a site in one place as well as 24/7 support no matter where you are. In April 2017, they were acquired by U.S.-based Hostopia. Cloudflare and Railgun: All products come with Cloudflare and Railgun to help protect your domain and Railgun to improve performance. Website Builder Pro: Panthur provides RVSiteBuilder for free with all plans. It’s a little dated but still a decent tool. Whitelabel for resellers: This is a pretty unique service to help resellers create custom experiences for their customers with private name servers. Magento boosting: Stealth hosting comes with LiteMage which will help boost your Magento site performance if that’s what you’re using. You can manage your SSL, domain, email accounts, and backups in a single point of contact. It can be a chore to get caught between service providers. RVSiteBuilder isn’t the greatest website creation tool, but it gets the job done. You can always install WordPress if it’s more to your liking. Panthur has thankfully kept pricing very simple. Plans are organized under either Economy Web Hosting for individuals or small companies, Business Web Hosting business for medium to large companies, and Stealth Web Hosting for enterprise or e-commerce intensive websites. There are also a few reseller plans available. Overall, pricing is very cheap for what you get with even their Stealth plans remaining below $200. Every product comes with SSL certificates, backups, support, 30-day money back guarantee and unlimited email accounts and SQL databases. All plans can be billed monthly, semi-annually, and up to 5 years with longer plans at discounted rates. Economy Web Hosting: Three plans starting with 2 GB storage, 100 GB bandwidth, 0 addon Domains up to 10 GB, 500 GB, and 5.
Business Web Hosting: Three plans that all have unlimited bandwidth. It goes from 2GB storage and 10 addon domains to 100 GB and Unlimited domains. Hardware performance is also increased from that of Economy plans. Stealth Web Hosting: Three plans all with unlimited bandwidth and addon domains. Storage tiers from 25 GB to 75 GB. Hardware performance is further increased. Reseller Web Hosting: Similar pricing plan structure as Stealth hosting with more storage space, Whitelabel services, and additional cPanel accounts – basically everything you need to run a reseller service. You definitely have no shortage of resources if you run into a problem and want to fix it yourself. They provide both an extensive knowledge base as well as a library of video tutorials for just about anything. If you need support, you can use the 24/7 ticketing system, their Australia, New Zealand, or international phone line, or email them directly. Response times are generally good on all channels. You shouldn’t have to wait for more than a couple of hours to receive an answer using the ticketing system. The biggest problem for international users is that Panthur data centers are based in Australia, which is remote on a global scale. However, with free access to Cloudflare & Railgun, you can combat any performance problem. They otherwise provide an excellent service with great pricing and features. Wondering how Panthur stacks up against other Web Hosting companies? Enter any other Web Hosting company and we will give you a side-by-side comparison.